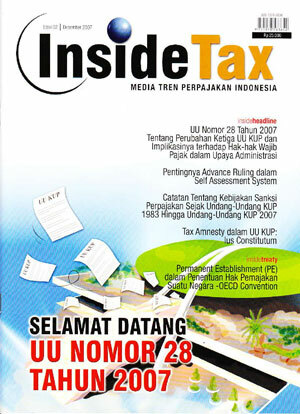 In this edition, InsideTax magazine attempts to lay out the direction and purpose of the changes of the new General Tax Provisions and Procedures Law. Related to the tax amnesty issue which was brought forth in the establishment and discussion of the General Tax Provisions and Procedures Draft Law, unknowingly, it has actually been accommodated by one of its chapters. However, the tax amnesty which is stipulated in a chapter of the new General Tax Provisions and Procedures Law is no as expected by the parties proposing the tax amnesty issue. On another note, we need to consider that with the changes in the new General Tax Provisions and Procedures Law, a taxation supervisory committee will be set up based on Financial Minister Regulation.